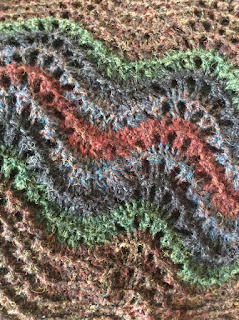 Most of my week so far has been spent knitting and reading Jilly Cooper's 'Jump' - well the little bit of week left when I'm not at work. 'Jump' is a mixed bag - not terribly good (nowhere near as good as I remember 'Riders' or 'Polo' being) but somehow difficult to put down. 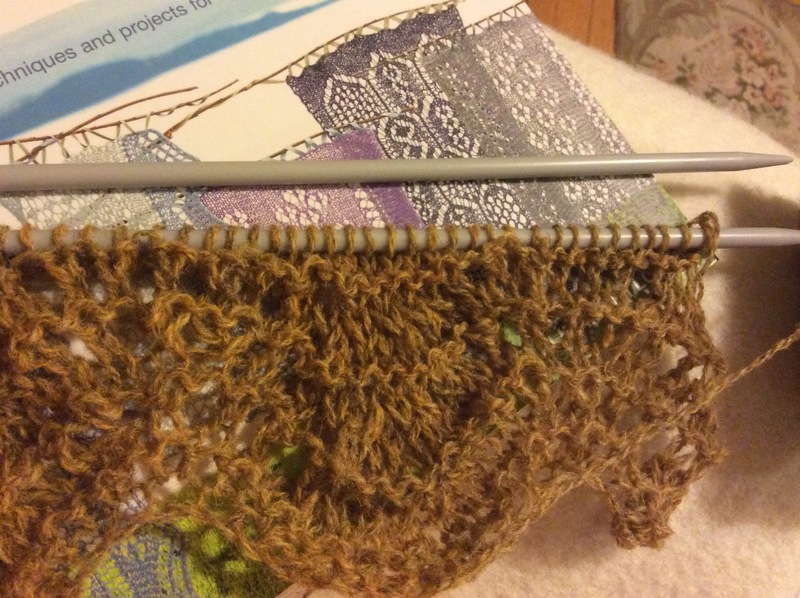 The knitting is more of a success. 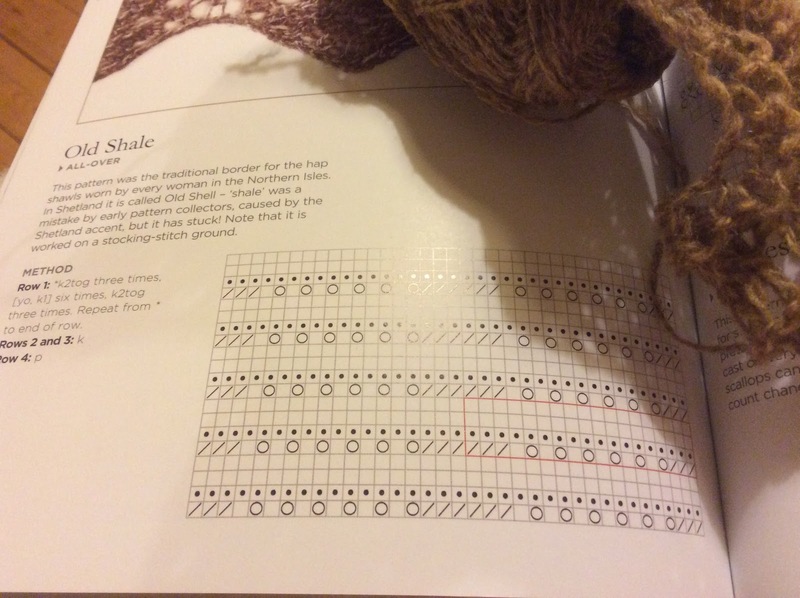 I've been happily experimenting with the open work pattern Old Shale - it's a perfect starting point because it's probably the simplest pattern in the book and has been great for building confidence. This is a short round scarf, for days when a serious scarf is to warm but no scarf isn't warm enough. So a day like today basically (it's not so much the cold of this summer that's getting me down, but the constantly grey sky). 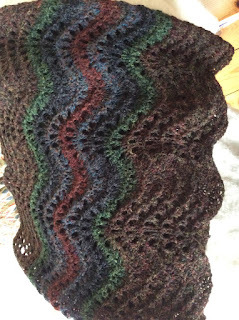 This one is destined to be a present, another one will be forthcoming, but I think I need to summon the courage to try a slightly more complicated pattern. I read this book almost 2 months ago - shockingly lax blogging on my part to be only just getting round to it now - and my memories of it are no longer as fresh as they should be for which I can only apologise. It's a book that deserves a bit of thought and unless I have a very clear idea of what I want to say blog posts take me a couple of hours to write at the best of times, the more I like a book the longer it takes. Not normally this long though. I haven't read Harrison's debut 'Clay' but it seems to have been widely praised. 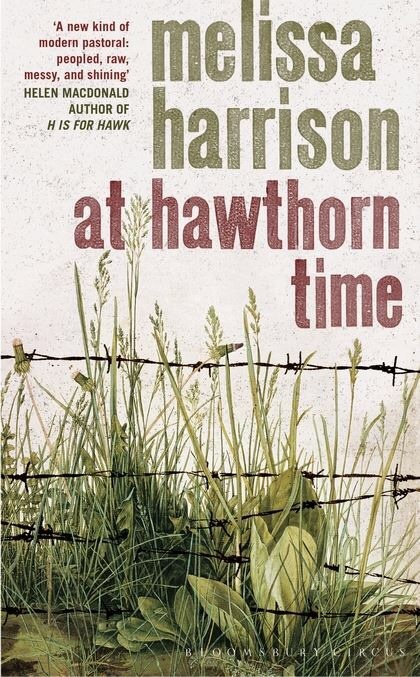 I did pick up on the buzz about 'At Hawthorn Time' though, and was further attracted by the beautiful cover (exquisite even) as well as the title which turns out to be perfect for the book. It manages to sound slightly ominous as well as evocative. The book opens as it closes, at the scene of a terrible car crash, we know from the first page that somebody has died, and by the end of the book know that it is either Jack the old fashioned tramp and itinerant farm labourer, Jamie, a young local boy just beginning to work himself out, or Howard, recently retired and a recent resident in the village of Lodeshill. The body of the book quietly unravels these lives before bringing them back together for that final catastrophic meeting at dawn on a May morning. Jack is newly released from prison where he's been held for trespassing. He should be in a half way house and is terrified of being picked up by the authorities again. He can't understand the hostility his chosen way of life rouses, but it's also clear that he's not quite well, and he's so out of step with the world it's inevitable the hostility will increase. Jamie is not long out of school, freshly embarked into the world of work and both rediscovering and losing childhood certainties. On the one hand he's rediscovering the familiar landscape around him, no longer able to take it for granted, whilst on the other family relationships are changing into more complicated patterns. As for Howard and his wife, Kitty - the seemingly content couple who have taken early retirement are not quite as happy as they look. These are lives full of small tragedies and joys. Ordinary personal tragedies; a lost baby, a lost battle with alcoholism, failing health, failing marriages, and people getting old. Common experiences that tie us all together even when they're not talked about. Meanwhile it's all played out against the explosion of beauty and burgeoning life that makes an English May when spring bursts into extravagant leaf and blossom. Some things will always go on regardless, and the hawthorn is quite indifferent to human drama. It is a beautiful book, turned into something special by the descriptions of early summer in a generally quite ordinary place. Each chapter is headed with a list; notes of flowers, the weather, trees budding. Every review I've read has assumed these are Jack's notes of what he sees around him, and they might well be, but I thought of them as something independent - the landscape itself another protagonist. Still on a Shetland theme, this is a herring girl's story. Shetland has an excellent main museum and some very good heritage centres, and archeological sites dotted around the islands. (Unst is particularly good with the boat haven - where retired boats live - and a heritage centre that has some very fine knitwear along with other treasures) but there are some stories that could be better told. 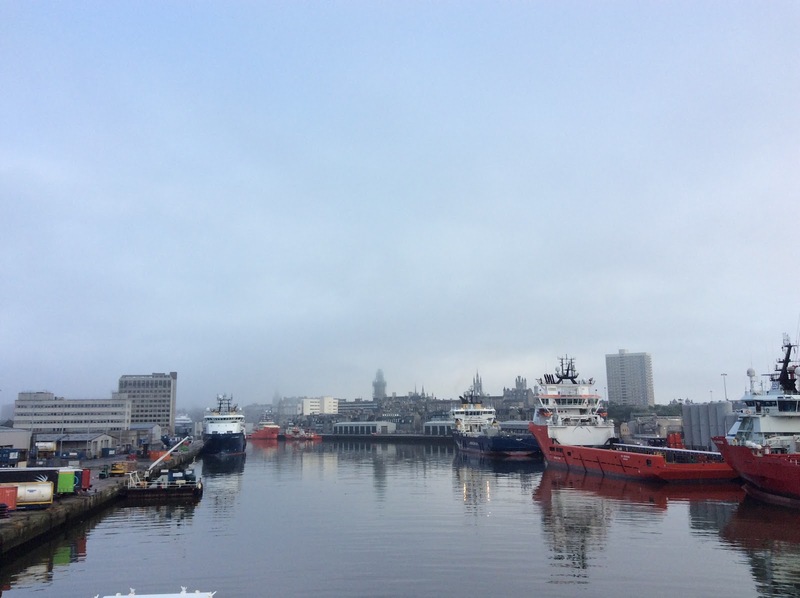 One of these is the story of the herring gutters who followed the fish from Shetland in the spring down to Great Yarmouth and Lowestoft towards the end of the year. The girls came from all around the Scottish coast, worked in crews of 3, 2 gutters and a packer, and worked extraordinarily hard. There is just enough information about them to be found in various displays, archive photos, and fishing station remains to be intriguing but not quite enough to really satisfy curiosity. Maybe it's because this was a way of life that's still just about within living memory, as well as not being a terribly glamorous occupation, that it's not as celebrated (though that's not quite the word I want) as it could be. Girls would start to follow the fleet from as young as 15, they could gut up to 60 herring a minute - that's upwards of 3000 an hour if they could maintain that rate - and they had to be that fast because it was essentially piece work. They were paid a basic wage which just covered accommodation and food, a wage so basic that it not only failed to keep pace with inflation but actually went down to the point that in the 1930's they had to strike for more. At the end of the season they were then paid 1 shilling a crew for every barrel filled, that covered any outstanding bills and had to cover them for the rest of the winter. A barrel contained between 700-1000 fish. The barrels would be randomly checked by prospective purchasers, if any fish gut remained the barrel was rejected and no money paid for it. The girls were also grading fish according to size as they went (there were 5 different barrels to separate them into) which quickly became a matter of instinct - they didn't have time to look. All of this was done out in the open, fingers bound in linen to try and avoid salt sores and protect against cuts, and working for up to 14 hours a day depending on how many fish were coming in. 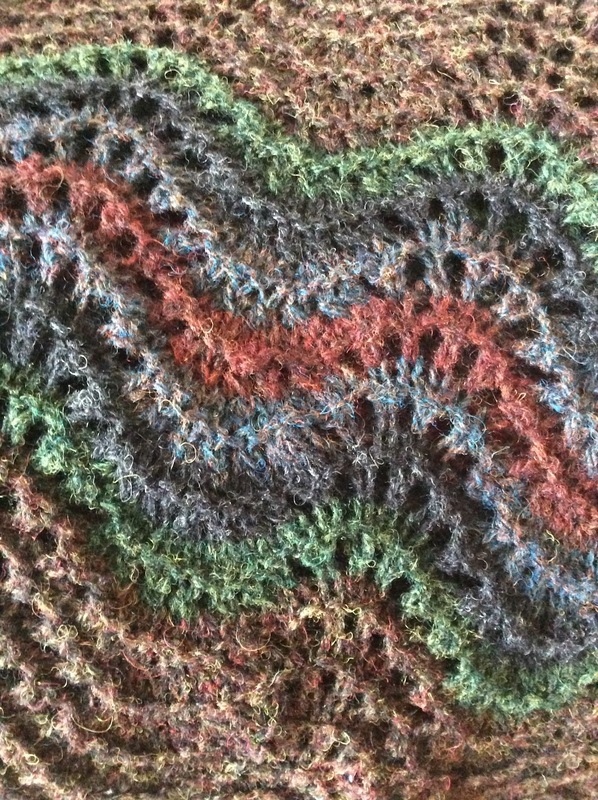 Time off was spent knitting. 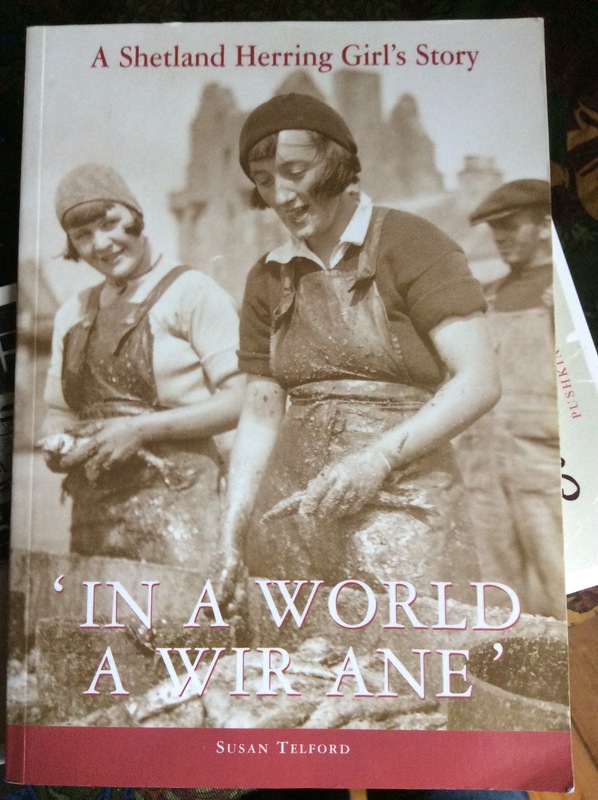 'In A World A Wir Ane' Susan Telford gives her grandmothers account of her early life in Lerwick, and then her years following the herring fleet before the war. It's a short book - only about 30 pages, but it gives a vivid picture both of life for a poor family in Lerwick from around the time of First World War, and what it was like following the fleet. It sounds like back breaking hard work, but with an element of fun in it too. The women - and some did this work into their 70's - were obviously a close knit community. Christina seems to have enjoyed the life, memories of hanging out in pubs persuading men to buy them the odd port and lemon, or finding someone to pay them into dances on a Friday night (sixpence, which the girls didn't have spare) show that there was time for fun, even if they were still picking the herring scales off their arms on the way out. I keep wondering about what sort of women not only survived this work (think about how many fish they would each have processed in a day - it runs to tens of thousands) but thrived in it, and what the relative independence not only of an income but also being away from home meant to them. There are some great pictures in this book which really help bring it to life - all that's (thankfully) missing is the smell, and maybe the noise. It's also worth noting that it's written in Shetland dialect, not impossible to follow if you're unfamiliar with it but not necessarily easy either. I found it through a post on Ella Gordon's blog Here, the Shetland museums picture archive is available online Here and is an excellent resource. 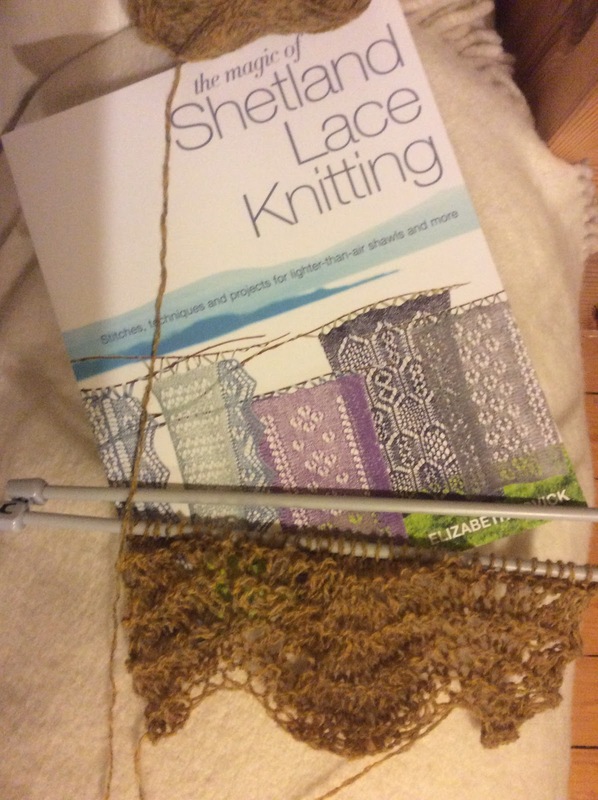 I always find it hard to write about books which elicit a really personal response, and as this one touches on something I've never been comfortable talking about (homesickness) this post will take me a while to work out. 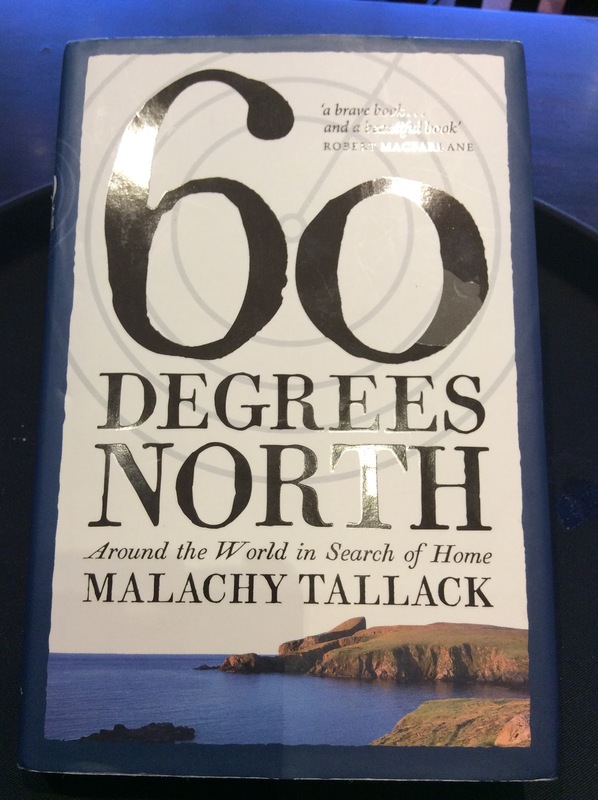 I first read about '60 Degrees North' in Polygon's book list back in the spring and was intrigued then. I recognised Malachy Tallack's name from old bylines in The Shetland Times, and the 60 degrees latitude sign on the road from the airport has become a small but distinctive landmark on the way home. The idea of travelling the parallel, following it all the way round with home as start and finish line is attractive (though I suppose home is always the start and end of a journey). It's a line that crosses Shetland, the southern tip of Greenland, Canada, Alaska, Russia (a lot of Russia - much of it Siberia but also, and exceptionally, St Petersburg which must be the largest centre of population on the parallel by some way), Finland, Sweden, and Norway. 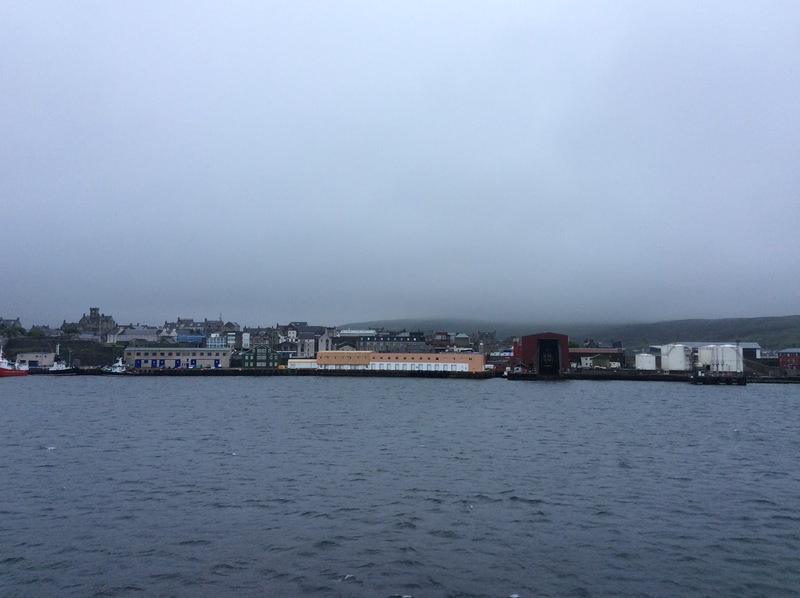 The thing about Shetland is that although it looks peripheral on a map of the UK when you're there it's nothing of the sort. It's cultural links are as much with Scandinavia as with the UK but more than that it's a place that feels extremely confident of its own culture and traditions. It's not on the edge of anything, but the centre of its own community - broadly speaking anyway. There is some discussion at the beginning of the book about what North is. I'm happy to accept the argument that the 60th parallel is as good a way as any of marking the line between almost-North and North. The long hours of daylight (at 60 degrees the sun is above the horizon for 19 hours a day around midsummer, and for a few weeks at least it doesn't get really dark at all) in summer hint at the need to adapt to the elements that challenging winter weather makes explicit. This near North is the accessible part of something that is almost as much idea as place on a map. Where life is quite supportable but there are constant reminders of something wilder, of places that can't be tamed. Robert Macfarlane calls this 'a brave book...and a beautiful book', the brave bit was something I was dismissive of before reading but feels fair now. It has something in common with Helen Macdonald's 'H is for Hawk' in that it deals in part with the sudden death of a father. Tallack's father is killed in a car crash whilst his son aged 17 is fishing, and later waiting for him to pick him up. It's not much of a spoiler - it's how the book opens - and inevitably it derails his life. That sense of loss is present throughout the book, it's not the raw grief that Macdonald describes but it's there nonetheless, most especially in Tallack's search for somewhere to think of as home. Beyond the autobiographical element it's part travel writing, part natural history, and partly something else. The something else is a meditation on place and community and a lament for the way we're losing our connection to the land we live on. At the beginning of the book Tallack talks about the Shetland 'hill' - common ground where sheep and ponies roam at will and which he sees as being 'in many senses, an in-between land...where time itself seems to move at another pace...' I know just what he means, and also when he says the land inhabits the people just as much as they inhabit it. It's why one of the hardest changes to accept when I go home is seeing so much of the hill that was open is now enclosed by fences. No longer a shared space but a claimed and bound one. 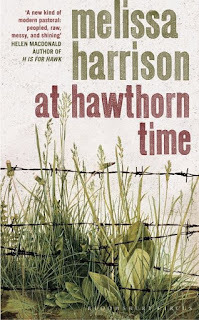 I've been meaning to write about Mellisa Harrison's 'At Hawthorn Time' basically since hawthorn time, but it's a book that deserves a thoughtful review - which means it wants some time devoting to it - and yet again I've allowed myself to be distracted. It was a productive sunday in the kitchen though. I've been playing with Olia Hercules 'Mamushka', made my first jam of the season, and managed to make a loaf of bread along with other chores, which all makes me feel very virtuous (or possibly smug). 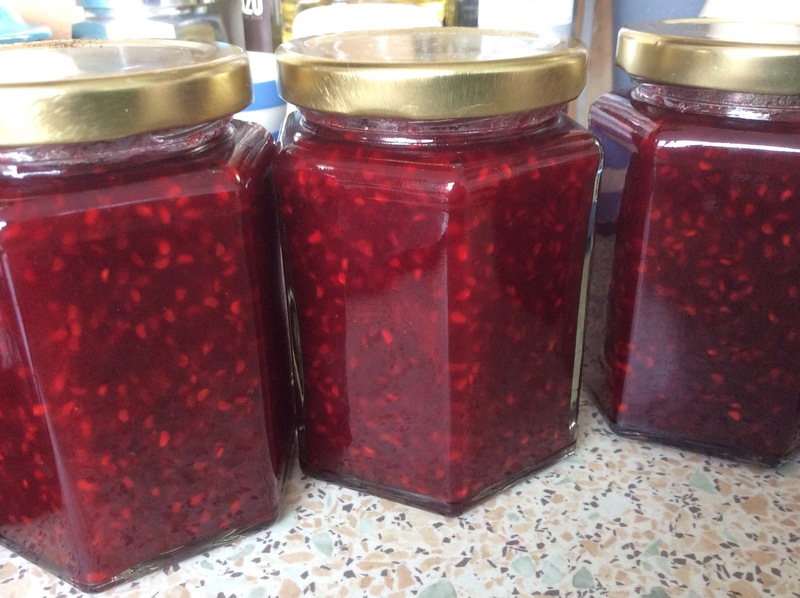 The jam was raspberry and vanilla courtesy of a kilo of them from my mothers garden. The recipe is the Fridge Jam from the river cottage handbook on preserving and is basically half pectin enriched sugar to fruit. Half the fruit and the sugar is mashed together, the rest added whole, then it's gently heated until it the sugar melts and it starts to boil. It needs 5 to 7 minutes at a rolling boil and then skimming before going into sterilised jars quite quickly. It's a lovely jam - relatively low sugar and doesn't at all need vanilla but it was a day for tinkering. 'Mamushka' has been inspiring reading for the last month or so but it's taken me a while to actually make anything from it - I can't wait for autumn though, there are lots of colder weather recipes I want to try. Fortunately a Polish supermarket has not long opened around the corner which will help with finding ingredients. I went in on Friday evening looking for twarog (cheese) to finally make the Ukrainian cheesecake, where thanks to google translate I managed to avoid buying a flavoured version, and cast very covetous eyes on the polish cheesecake. Unfortunately I did something I never normally do - broke the eggs straight into the mix, and for the first time ever found a bad one. I baked the cake anyway - everything was already in it - and tried a small (very small) piece with no obvious ill effects but still dumped the cake just in case. 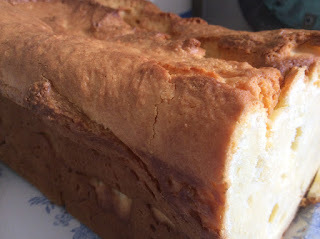 Partly inspired by the Polish cake, and partly by a Japanese cotton cake my sister makes, Sunday's version was a bit lighter with cream cheese and self raising flour added, instead of cottage cheese and semolina. The results are pleasing either way. The recipe calls for 100g if butter, melted and allowed to cool, a greased 1kg loaf tin, and the oven heated to 160 degrees C. 500g of cottage cheese (or cream cheese), 3 eggs, 100g of sugar, 200g of flour (or a split of flour and semolina) the butter, and a tablespoon of vanilla extract get mixed together, poured into a tin and baked for an hour or until done. Please bear with me on this... The perhaps not terribly impressive bit of knitwear I'm presenting here (in all its unfinished glory) represents a huge leap forward in my (admittedly extremely modest) skills. In an ideal world when I decided I wanted to re learn how to knit there would have been a pool of expertise I could call on for tea, advice, and maybe even a biscuit. As it is I'm relying on books, which is fine until I've found something that's really hot me stuck. My sticking point, and a real blow to knitting confidence, was a total inability to master 'a simple chevron pattern' or anything which demanded that stitches be added and subtracted. 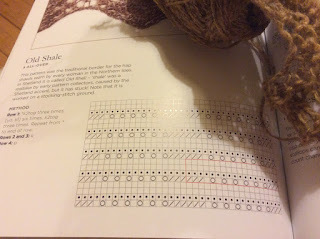 Every time I tried it I ended up with extra stitches, dropped stitches, and an increasing sense of frustration. In short I didn't find it in the least bit simple. made perfect sense of the written instructions. It might not look like much at the moment but I'm definitely getting the hang of this. 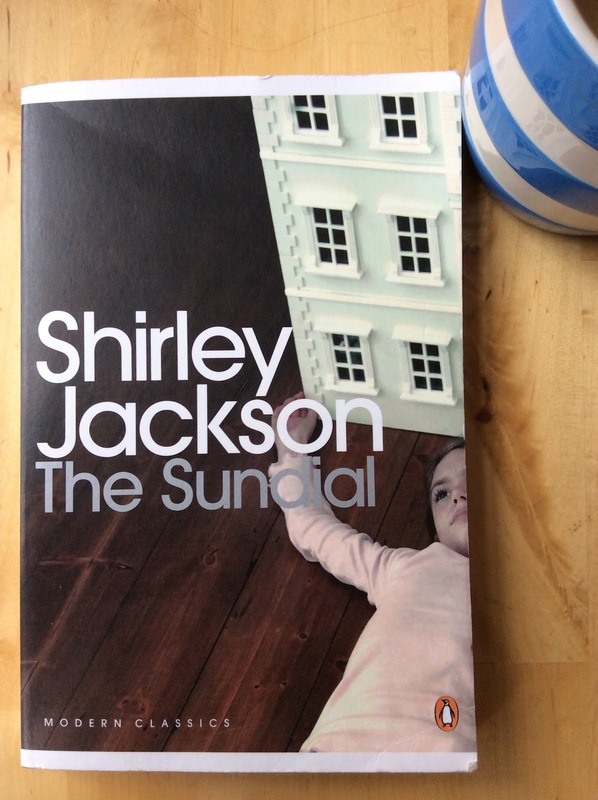 I thought Shirley Jackson reading week was a month ago and had been annoyed with myself for not finishing 'The Sundial' in time, turns out I had the dates wrong so I can still come to the ball. I think I read 'We Have Always Lived in the Castle' after reading an article by Elaine Showalter where it was highly recommended - and promptly fell in love with Jackson. I read 'The Haunting of Hill House' soon after (sort of familiar from the film versions) and then 'Life Among the Savages' (very funny account of raising her children). After that there were a few short stories, and then a longish wait before Penguin reissued more of her back catalogue here in the UK. I bought them all with suitable enthusiasm, but haven't until now read any of them - Jackson's brand of claustrophobic (or perhaps agoraphobic is more accurate) gothic horror has been biding it's time to appeal to me again. I think the best way to summarise 'The Sundial' is probably that hell is other people. It starts with a family returning from a funeral. Lionel Halloran has left the Halloran house and estate to his mother. Orianna Halloran is victorious, the rest of her family seem to hate her. Her daughter in law is openly stating that Orianna pushed Lionel to his death, her granddaughter, Fancy, is happy to repeat it, her sister in law Fanny despises her, and the paid hangers on, Mrs Ogilvie and Essex, seem resentful of her power. Orianna's husband, Richard, is wheelchair bound with a failing memory. Orianna's first intention is to evict everyone but Fancy and Richard from the house, but her plans are thwarted when aunt Fanny has a vision in which her dead father tells her that the world is going to end and only those in the house will be saved. The father will protect his children. quickly the family comes to believe Aunt Fanny, and start to prepare for the end, gathering a rag tag collection of hangers on in the process, and we all wait to see what happens. The first thing to note is that everybody clearly hates each other, the second is that it's an extremely funny book - which makes it more disconcerting, and finally - it is a very disconcerting book. It will be interesting reading Jackson's other earlier works to see how often she returns to specific devices - I see things in 'The Sundial' which are worked out, and into, 'We Have Always Lived in the Castle' and 'The Haunting of Hill House' - both of which I found more straightforward than this one. Jackson has her characters believe aunt Fanny's predictions, and indeed they seem as if they could be coming to pass, but I can't decide if she means the reader to believe as well. Written in 1958 it's a book of the nuclear age and the Cold War. It's never discussed - nothing outside the enclosed grounds of the house ever really is, but the bunker mentality that this small coven of antagonistic women and sycophantic men embrace reminds me of the draw the curtains and hide under the bed sort of advice that came in government pamphlets even when I was at school. It remains one of many unanswered questions though, which is what makes the book so compelling as well as unsettling. It's very much like getting lost in a maze where all the paths seem to be dead ends. I see a few people describe this as their favourite Jackson - I feel far safer with the more straightforward 'I Have Always Lived in the Castle', but what 'The Sundial' has done is make me completely reassess Jackson. I knew she was funny, and knew she was a master of gothic creepiness, but this is more subtle (downright slippery) than anything I'd previously read. It requires more effort from the reader (at least from this reader), and makes me realise I'd seriously under estimated her. I'm not so sure what to expect from those other books now but I'm looking forward to having my preconceptions about them challenged and getting a far better understanding of a favourite author. the latest issue of Shiny New Books has been posted, and is as ever full of temptations. My contribution is a piece on Sir Walter Scott's 'Waverley' here Waverley is awesome, you should probably read it (the link title is a concise précis of my thoughts on the matter). I wrote a bit about Waverley when I read it so won't say much more about it now other than that it would make a great holiday read. Honestly, it would. I think I'm still recovering from the effects of our long trek home - after the night in the boat I can't seem to get enough sleep. Between that and work I'm behind on everything, but with any luck will start to catch up soon. (I went to bed early last night with every intention of waking up at 6 to write this. It didn't happen.) People in their 40's who say they still feel 20 baffle me. Maybe I'm doing it wrong. 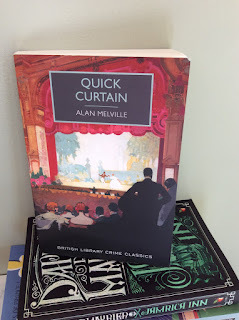 'Quick Curtain' on the other hand positively fizzes with energy. I say this every time, but I'm a big fan of the British Library series of crime classics. I love the packaging, love the idea of digging through that vast archive for treasure (at least that's how I like to imagine the process), and most importantly love the books too. It's a collection which has really expanded my conception of 'golden age' crime. 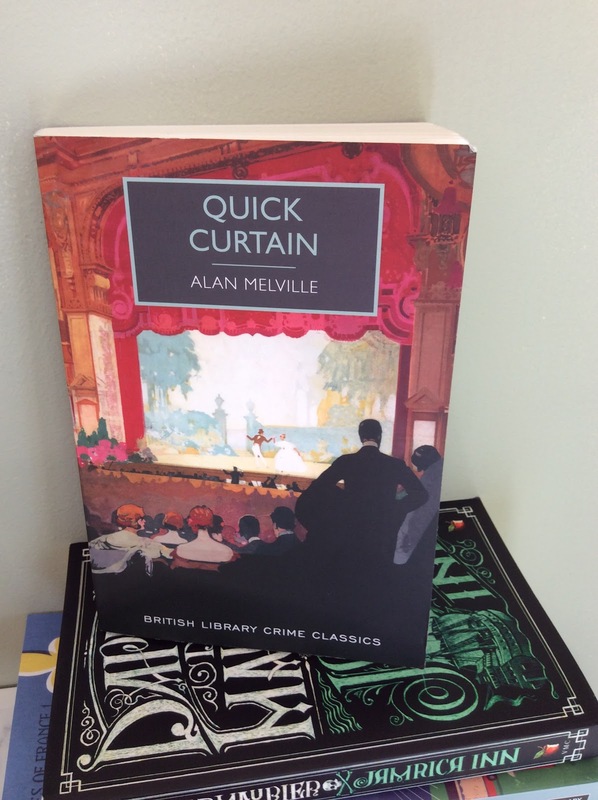 With 'Quick Curtain' and Alan Melville the revelation is his humour. Had P. G. Wodehouse and Dorothy L. Sayers collaborated on a murder mystery it would probably have been a bit like this. Fans of Anita Loos wouldn't be disappointed either. As it is Sayers simply observes that Melville 'Blows the solemn structure of the detective novel sky high...' He does, and it's wonderful. Published in 1934, the setting is a lavish musical replete with dozens of chorus girls and an ageing juvenile lead who is unfortunately shot in the second act. When the man with the gun is found dead in his dressing room it looks like an open and shut case of murder followed by suicide, that is until Inspector Wilson and his journalist son Derek get involved. As Sayers also pointed out 'Light entertainment is Mr Melville's aim', he happily satirises the procedural detective novel always looking for, and finding, the laugh. Derek's experiences under cover as a hiking cyclist are a particular joy but it's hard to say much without giving away whacking great spoilers - the twist at the end though is brilliant. Melville is undoubtedly overdue for rediscovery, it's a funny and charming book, perfect for a lazy afternoon or light reading before bed. Because the humour takes centre stage and it's packed full of show business jokes and details it's also a book that I'm likely to re read regularly in much the same way that I might re watch a favourite film from the same period. It truly is a brilliant find from the British Library. There is an Age Concern bookshop on my way to work that I sometimes manage to hit for a magical five minutes after it's opened and before I have to be at work. It would be more regular but I'm at the mercy of arriva buses and their somewhat relaxed attitude to timetabling. It generally has something good in it, especially if you like poetry and victoriana. 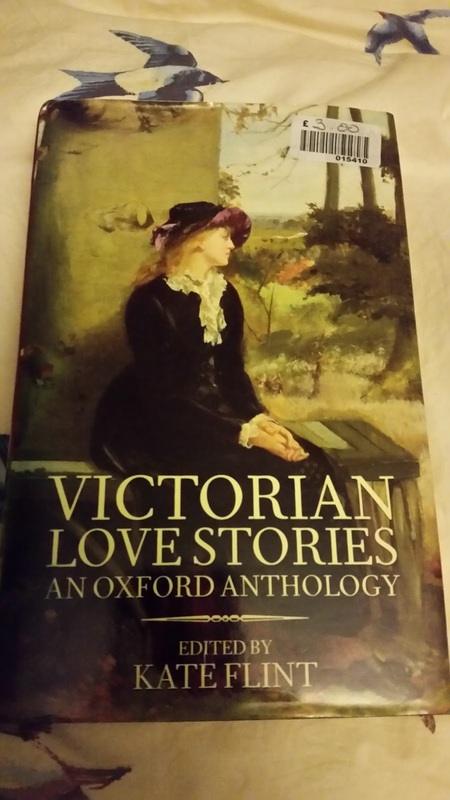 At £3 an Oxford anthology of Victorian love stories was a bargain. It looks to be a good mix of writers I know (and like) and ones I've not heard of. It should be interesting. After two weeks of thoroughly relaxing family time and catching up with old friends leaving Shetland turned out to be harder than expected. Literally. 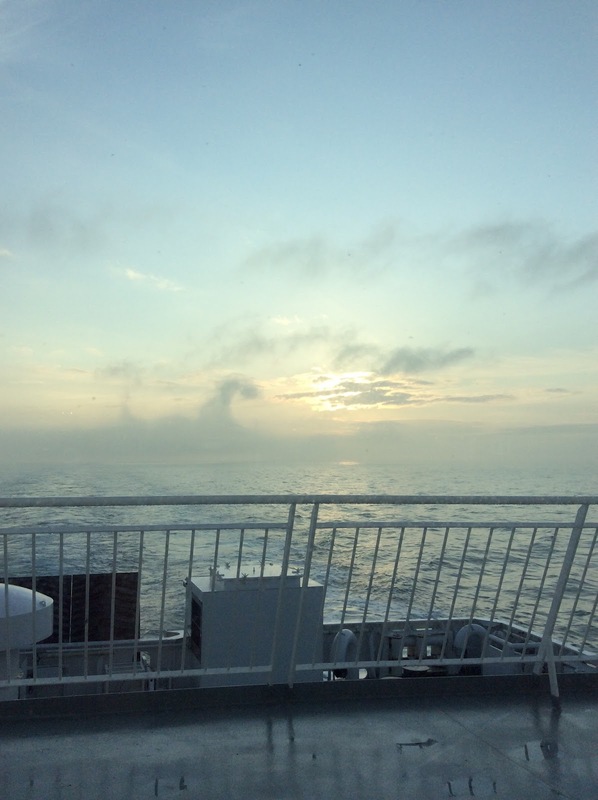 It's always a wrench when it comes to getting back on the plane and saying goodbye for another year, but this time the islands were fog bound due to a thick sea haa, no flights in, no flights out and now I'm on the ferry. 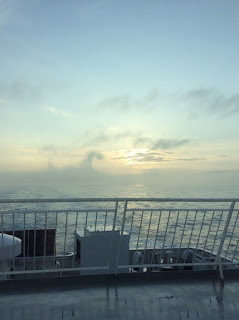 The ferry is an overnight business, full to capacity, and has a poor selection of seasick remedies. We're lucky to have cinema seats for the night to try and sleep in. 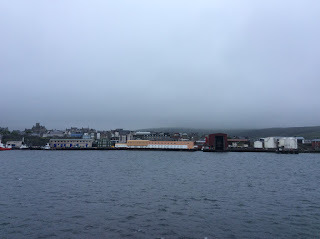 Aberdeen is misty, when we finally dock (7am). It's the city I went to university in and have been meaning to visit again ever since. The docks however were not one of my haunts and as everything else is shrouded in mist it's basically all we see. I am very grateful to a) have a travelling companion, and b) that we're both determined to be calm and pleasant. Especially as our flight from Aberdeen is now, wait for it.... delayed. We would have had time to go exploring (though not very tempting with heavy suitcases). There's not really much to complain about. Everyone has been pleasant and helpful (bar the snoring man), it's not exhaustingly hot or freezing cold, and there has been no extra cost. We are now very tired though, and I have to admit I'm clearly not a born traveller. Book posts to follow shortly (just need to catch up on some sleep first).